What fun to find another tatter, hooray! Gorgeous thread color! I hate it when people inform me that tatting is a lost art. They don't know about all of us. Pretty thread. Hope you get more time to tat. Another tatter! Yea! Love the thread! Very pretty thread... could be a lovely crocheted little girl's hat??? Thanks Fox but don't know any little girls - no grandchildren etc!!! You found another tatter, how nice for you. Hope you get together for some show and tell. 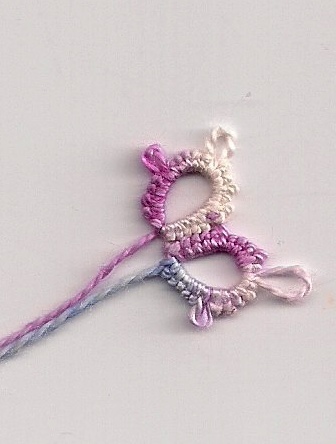 Pretty threads - you could probably crochet with them - bookmarks and small things. They look like perle cottons,. maybe they would also be good for embroidery? I have tatted with Caron Wildflowers and what I have is similar to size 30 cotton. Is yours thicker? My mother used to crochet flowers to decorate clothing with a similar but thicker Caron thread. Did think about splitting them Sue but thought that was a lot of bother! Might try just using this thickness to start with, last result send them your way! Pretty threads. There's a whole lot of tatting out there Carol,welcome to our world! Don't split them - those 'Wildflowers' threads were made to use 'as is.' The needlework shop where I used to live sold quite a lot of them to use for cross stitch and needlepoint. There may be 2 sizes, not sure. The size I tried gave results about equal to a size 10 'tatting' thread. It's not 'floss' though - more like perl cotton. They are gorgeous colors. Hope someone gets the message!